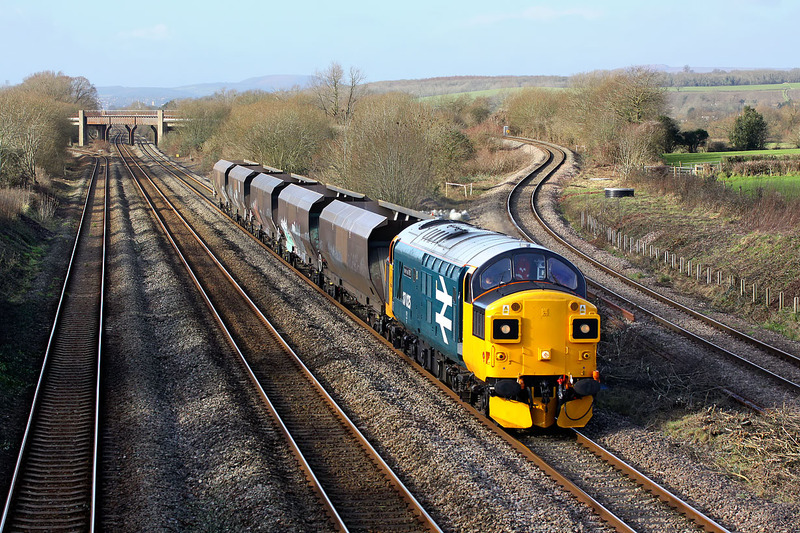 37025 Inverness TMD passes Llandevenny on 30 January 2016 with the 4B20 08:37 Barry to Barry Colas driver training special. Unfortunately, after standing around in unbroken sunshine for an hour, just at the critical moment a cloud partially covered the sun. Also, the hoped for picture of the train traversing the curving single track line from Bishton Flyover (seen in the background) was thwarted by the train unexpectedly being routed along the up main. My bad luck did not end there, as I had planned to get another picture of the train returning from its booked run round at Swindon, at either Chipping Sodbury or Acton Turville. It was only after I had crossed the Severn Bridge that I found out that the train was in fact running round at Bristol Parkway and heading back to Wales! Rather than retrace my steps back to Wales, I decided to head for home!